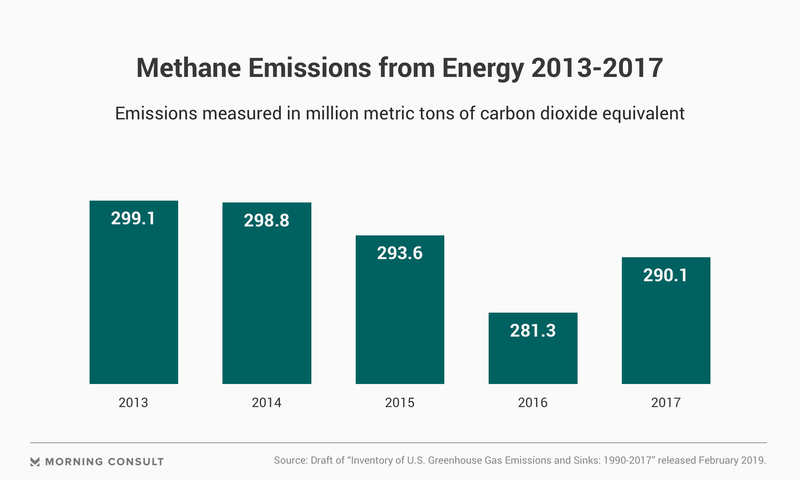 Initial figures from a federal inventory of U.S. emissions calculated an uptick in methane emissions from the energy sector in 2017 compared to 2016. The Environmental Protection Agency’s draft of its report, “Inventory of U.S. Greenhouse Gas Emissions and Sinks: 1990-2017,” depicts an increase in energy-related methane emissions to 290.1 million metric tons of carbon dioxide equivalent in 2017 from 281.3 million metric tons in 2016. According to the data, coal mining in particular contributed to the increased emissions of methane, a potent greenhouse gas that holds heat in the atmosphere more effectively than carbon dioxide. While methane from natural gas systems increased by 1 percent in 2017 from 2016, there was a 16 percent increase in methane emissions from coal mining during the same time period. The report attributed the spike to “a modest increase” in coal production and to less methane being recovered and used in the sector, where methane is released from work related to underground and surface mining and from coal-handling activities. Overall, since 1990, the agency’s latest figures indicate a decrease of more than 77 million metric tons of carbon dioxide equivalent of methane emissions from energy. In a statement from a spokesman, Howard Feldman, senior director of regulatory and scientific affairs with the American Petroleum Institute trade group, focused on the downward trend of methane emissions witnessed since 1990. Feldman pointed to the decline in per-unit production emissions of methane as U.S. production has increased. Many past EPA emissions estimates are recalculated and revised each year, according to the draft. An EPA spokeswoman said in an email that the numbers in the draft reflect the latest methodological updates to the data. Some scientists remain concerned that the EPA undercounts methane emissions from petroleum and natural gas systems. A study published in Science last year tallied about 60 percent higher methane emissions for oil and natural gas supply chains than the agency’s estimates. The approach that the agency takes for its calculations particularly underestimates emissions from large, abnormal emissions sources, said David Lyon, a scientist with the Environmental Defense Fund and a co-author of the report in Science. The EPA did not respond to a request for comment on the claims of undercounting methane emissions. The emissions increase, Lyon said, also shows that progress is not being made toward the drastic reductions in carbon dioxide and methane needed to prevent and mitigate climate change impacts. The EPA said it expects to issue a final inventory for this year by April 15, by which date it is supposed to provide the document to the secretariat of the United Nations Framework Convention on Climate Change.